Ok, Here I am revealing how the MDI engine works in OS SHP Builder and how it affects the programmer. This uses the code of the OS SHP Builder Beta 3.0 Built 23/04/2004. - MDI stands for Multiples Documents Interface. The MDI engine was implemented to make OS SHP Builder support multiples files like PSP, Photoshop and other good 2D graphic editors do. BS SHP Builder 1.x and 2.x used to work with only one file and all its data centralized in one place (Form Main). By changing multiples files, a MDI obligates the program to split into files and the interface. Unlike PSP and Photoshop, OS SHP Builder's MDI engine was also made to allow different windows access the same SHP file. So, we had to split the program in editing windows, shp files and interface. The interface may feature as many SHP files as the user want and each SHP file has as many windows as the user wants, However, only one SHP File and only one Window will be active at a moment. The interface is responsible for indicating the active SHP file with the variable "ActiveData" and the active editing window with the variable "ActiveForm". View the attachment with the Data Structure graphic for further info. In that graphic, the first window of the second SHP File is the active window. The MDI engine will be totally responsible for the creation and destruction of the interface, shp file and editing window. The descentralization of the file affects the variables used in other forms, although it doesnt affect its way of working. The interface is the FormMain. The Form Main only contains the top menu, the left toolbar and the statusbar. The Form Main also deals with user selection and TempView. It's the main responsible for the intercomunication of the program. The editing frame contains only one image and all variables related to image. Each window has its own selected colour and shadow settings, as well as its own show circle settings and also other settings that only directly affects the current image. 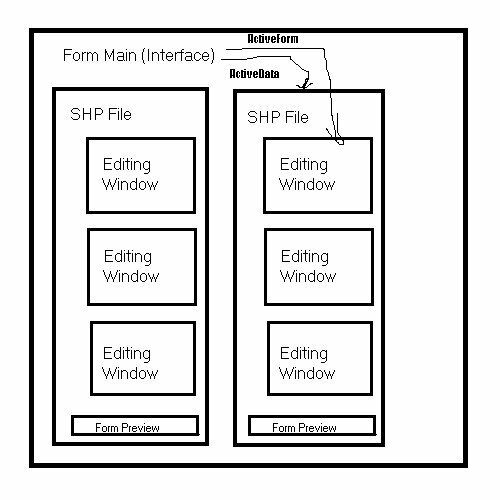 The editing window also has one variable that indicates which SHP file it belongs to. The SHP file doesnt contain only the SHP file. It also contains the palette, the undo settings, the filename and the forms linked into it as well as the preview window. The program accepts bidirectional comunications, which means that the interface can access all shp files that can access all windows linked into each of them and the window can access the shp file linked into them and the interface as well. However, only the interface indicates which shp file is active and which editing window is active. Total Images: Provides the ID of the SHP. This number only grows, so each SHP file will certainly have a different ID. ID: ID of the SHP File, used on searchs, close all and other stuff. It might look useless at OS SHP Builder 3.0. SHP: The heart of the program is here. SHPPalette: The Palette is no longer a global variable and now each file can have its own palette. SHPPaletteFilename: This was created with the purpouse of avoiding excessives repaints of the Palette, however it helps also the generation of new shp files. PaletteMax: I just noticed this variable should be in the editing window, not here. so it will be moved. Anyway, this is the max number of colours of the palette and interacts with shadows. UndoList: No longer a global variable. Now each file has its own undo list. ShadowMatch: Cache to speed up the generation of grayed frames. Filename: The name of the SHP file. Form: Holds the info about all editing windows linked into the SHP file. When no editing window is linked, it receives the value 'nil'. Form^.Item: Holds the memory address of one of the editing windows linked to the SHP file. You can control the editing window from it. Form^.Next: Holds the memory address of the next "Form". If there is no next Form, it's value get set to 'nil'. Next: Holds the memory address of the next SHP file. If this is the last SHP file, it will receive 'nil' as value. ActiveColour and ShadowColour: Controls the number of the colour selected by the user for active and shadow frames respectivelly. Zoom: Controls the current zoom factor value set by the user for this form. Frame: Controls the number of the frame that is being showed to the user. ShadowMode: Controls if the window has shadows on or off. show_center: Controls if the user wants a cross in the image showing the center. ID: Identification of the form. Currently useless, but might be usefull when we create a view menu that displays the windows that are opened. Data: Holds the memory address of the SHP file that the window belongs. To avoid circular reference, I had to use the type Pointer for it. Check further info on this below. Address: Holds the memory address of this form. Whenever the window gets activated, FormMain.ActiveForm receives the value of this variable. MainData: Holds the original SHP file, which is a sentinel used when there are no files opened holding several dummy or default values. It's needed to repaint the palette image as well as to allow the user to select the palette before creating or opening a file or importing an image. MainData^.Next will have the first editable SHP file when FrmMain.IsEditable = true. Data: It holds the memory address of the SHP file that was active when the form was originally activated. You can create a new version of AddNewSHPDataItem();, as long as the parameters are different and you end with an overload; in the end of the declaration. This file holds the MainData and the AddNewSHPItem and the LoadNewSHPImageSettings. It was originally made to deal with all MDI functions, although it currently shares this job with Form Main. The engine is quite fine, although it might be improved and some burocratic things might be able to be removed one day... maybe moving PaletteMax to the editing window or moving ShadowMode for the SHP file... well, Beta Testing might provide us the final answers. In the end, the program still runs in the same way, but with different concepts. I hope this tutorial helps you to understand the concepts behind the SHP builder... Anyway, I am opened for suggestions. If you think is there any way to improve it, post here. New Data Structure. The interface acepts multiples SHP files that accepts multiples editing windows and only one Form Preview.